Donovan McGrath is a Wanderlust Festival and Wanderlust Hollywood teacher. Try Amplified Yoga with him at Wanderlust O’ahu, Wanderlust Stratton, Wanderlust Squaw, or at our new 2-day city Festivals in Atlanta or San Francisco. Tickets on-sale now! In addition to Wanderlust, you can experience Amplified at Burning Man, or at Wanderlust Hollywood, Equinox West Hollywood, or unplug Meditation West Hollywood. Lights pulse from the stage. People close their eyes and gyrate their bodies to the pulsing rhythm, gathering ferocity with each beat. Someone in the back shouts as the experience takes over her. We may as well be at a rave, but dancing is contained to personal mats, and the teacher on stage chants traditional Kundalini kriyas into a microphone. Welcome to Amplified Yoga. “Amplified Yoga uses sound, rhythm, movement and ancient yogic technology to optimize you for the modern world,” says Donovan McGrath, creator and founder of the practice. 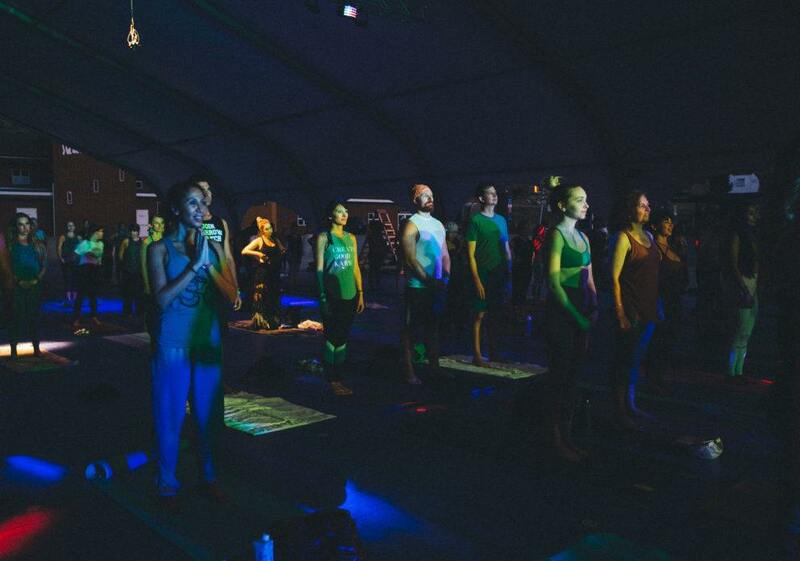 It’s hard to explain, but Amplified Yoga is a combination of soul-igniting Kundalini kriyas with the sensory stimuli of an EDM show, and the exaggerated movement of ecstatic dance. Donovan knows it doesn’t look or feel like a typical class, and anticipates resistance. “People might look at this and say, ‘Oh, this is a dance party, this isn’t traditional yoga,’” he admits. “But the concepts I use in Amplified Yoga are very much based on [Patanjali’s] eight limbs. The tradition, history, and philosophy of yoga are deeply entrenched but it is for this moment, in the modern world,” says Donovan. Like Sri Pattabhi Jois, B.K.S. Iyengar, or Yogi Bhajan, Donovan is a yogi rebel—each took the traditional teachings of their gurus, and adapted them as they brought and then popularized yoga in the West. While Donovan recognizes that Amplified may look different than a modern Vinyasa class (or even a modern Kundalini class), Donovan is just one teacher continuing to push the boundaries of what yoga means through this signature practice. Donovan knows that these are frenzied times. “People are feeling really burdened,” says Donovan, “we are dealing with things that have never been in our psyche before.” He says that being constantly attached to our phones—and always evaluating our experiences by how “Instagrammable” they are—does a number on our overall wellbeing. It’s not just technological demands that cause angst within our modern experience. It’s easy to get stuck in patterns that no longer serve, and change can be scary. A practice like Amplified encourages you to get outside your comfort zone. One such area where a practice like this can help is in overcoming addiction. “It is scary if you’ve always had alcohol every day of your life, for instance,” says Donovan, “and all of sudden you’re going to have to face life sober. This is an example of real world issues that people are dealing with that we work with in Amplified Yoga.” Donovan says that using the fear or discomfort that comes up in something like this practice lays the foundational ability to be able to deal with other types of fear or discomfort in daily life. The practice of Amplified Yoga isn’t however, limited in benefit to just the practitioner themselves. Donovan believes that if everyone confronted their fears, we would experience an energetic shift that would lead to a happier world. “Self-awareness takes grit,” says Donovan. “You have to look at the fire and make the flames bow to you or be consumed,” he says. If each person were able to extend a sense of liberation or happiness to people with whom they have relationships, we’d experience a trickle-down of embodied content. Lisette Cheresson is currently the Director of Content at Wanderlust Festival. She’s a writer, storyteller, yoga teacher, and filmmaker who is an avid vagabond, dancer, dirt-collector, and dreamer. She received her Level II Reiki Attunement and attended a 4-day intensive discourse with the Dalai Lama in India, and received her RYT200 in Brooklyn. Catch her teaching @dayayogastudio, or find her on Instagram @lisetteileen.